The purchase of the home would not have been possible without my loving husband who works very hard supporting our family and making us happy. The renovations of the home would not have been possible without our parents who worked countless hours doing laborious work to make this home, our home. Every project, aside from sanding the floors, was done by the hands of our family members. Every detail in planning for the renovation was kept in this binder. Room by room we added photos for inspiration and used this as a guide while working on the home. Receipts and budgets were also kept inside in clear sleeves to keep everything organized. This is the inspiration for the exterior which we will be completing this spring and summer 2017. The kitchen was one of the largest rooms in the house. The windows that lined the sink side of the kitchen are one of the first things that drew me into the home. There is so much light in the kitchen from morning until mid-afternoon. We wanted to create a space that maximized storage, functionality and light. Preparing the space for the dishwasher, replacing the sink and rebuilding cabinets and cabinet doors. Glass cabinets were one of the first components on our list. We visited the Habitat for Humanity locations in our area a few times before coming across a set of white glass cabinets. The set was around $1000. We borrowed my parent's kind and generous neighbor's van to pick them up. My Dad worked on the best use of space using the cabinets. This required taking all of the old cabinets down and out of the kitchen. We used masking tape to "draw" where the cabinets were going to go. We designed a pantry on the left side of the kitchen with glass cabinets above. The pantry and lower cabinets were designed and built by my father. My Mom did all of the cabinet painting. We ordered the glass cabinet door and drawer knobs online. Waiting for the cement to set. We decided on white concrete countertops. My Mom, Husband and Dad rented a concrete mixer and mixed the concrete. We ordered snap-off concrete molds and built the countertop frames. The concrete was poured and then vibrated to get any bubbles out of the concrete. Snapping off the molds was amazing. The smooth edges and top are remarkable and give the look of a natural stone. We used a terrible sealant. I applied it exactly as the instructions directed and within weeks it was cracking and staining. I do not recommend the brand that we used. We decided on a white subway tile backsplash. My Mom and Husband applied the tiles and grout. The flooring was one of the things I was most excited about. I wanted an antique brick floor that looked like some I had seen in photos of old French chateaus. We contacted a brickmaker in Pennsylvania but questioned the comfort of little barefeet on brick and the cleanliness factor. We found a brick tile that gave the same appearance but was easier to clean and more comfortable on your feet. Because our yard is a natural landscape and composed of red clay dirt we really needed something that would be durable. Adding lighting about the sink, replacing drywall and electrical. The main chandelier light was one we had over our dining room table in Florida. I found it at an antique store and knew that I wanted to keep it for our home in Virginia. Figuring out the lighting above the sink was a little trickier. We arrived at the idea of adding multiple lighting fixtures instead of just one. The three gold lights add a hint of industrial style that my husband favors while still blending with the antique look of the rest of the space. Cutting the holes in the drywall and lining up the electrical was not easy. This took multiple attempts and a day-break before completing. 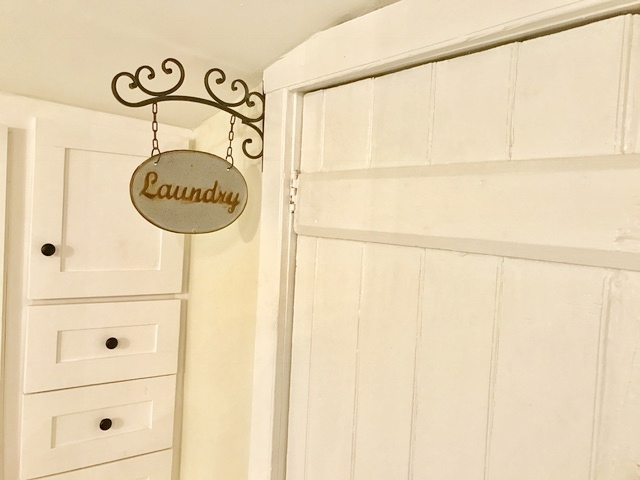 The laundry room was an addition to the home sometime in the 1940s or 50s. It is quite large and was an open canvas for designing more storage. 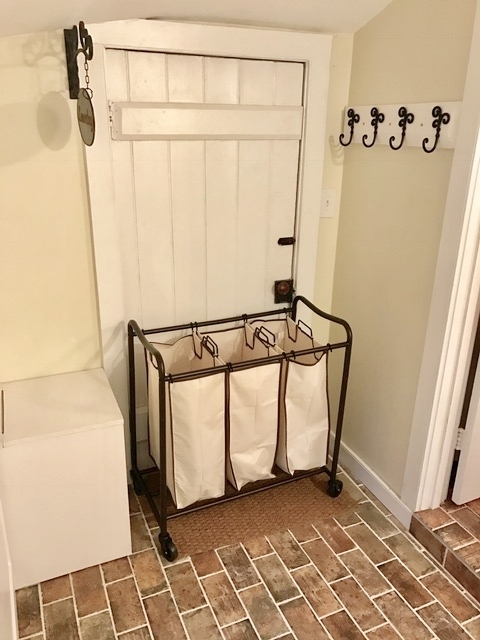 Initially I wanted the laundry room to have the appearance of a mud room with open areas to hang coats and bench seating. The laundry room is entered through the kitchen and I kept imagining walking past the laundry room and seeing jackets hanging. To me this felt like more clutter than anything and so we designed a closed closet with a hanging bar. We did drawers to the right of it for scarves and hats and we did a small bench seat that opens up for even more storage. My Dad designed angled cabinets that were installed above the washer and dryer. This stores all of our beach towels, household tools, craft supplies and washing detergents. Black floral wallpaper originally covered the walls in this high-ceiling room. My Mom took on the tedious task of removing it. She used a steamer and her incredible muscle to take all of the wallpaper down. Because the addition of this room was done many years ago the base of the wall behind the wallpaper was more of a plaster surface than drywall. Many layers of primer was added before painting it its neutral color that it is now. During the removal process we realized that there were two electrical hookups on the wall. We immediately started researching different wall sconces. The ones you see were found by my Mom online and were antiques. They arrived disassembled. My Mom, Mother-in-law and a bottle of wine were used when figuring how to put them back together. Fortunately when they were hooked up to the electrical... they still worked! We decided to use floor-to-ceiling curtains for a more dramatic look and to accentuate the height of the ceiling. The buffet that sits on the farthest side of the room was found at a second-hand store by my Mom for $50. She chalk painted the exterior and applied a varnish to give it its antique look. The farm table and bench was made by my parents, as well. The hardwood floors are the original hardwood. We hired a family business to sand the floors and we finished the floors with a clear sealant to keep the original beauty of the natural wood. The living room was one of the rooms my husband was most excited to work on. It is the original portion of the home which was once a two-story log cabin. The exposed beams were painted white when we first moved in. He wanted the beams to look exposed but that would have required either stripping the many layers of paint off of the beams or to sand them. Both options would be incredibly time consuming (and a pain in the neck) so my husband opted for painting them a dark brown color. The original mantle was painted white and my husband wanted to have an oversized wooden mantle. We contemplated "borrowing" a wooden railroad beam that was laying next to the local railroad track. We decided against it for legal issues. He contacted a few people who were selling large beams of antique wood but the right size and price was hard to come by. He resorted to building one himself. It essentially is a large rectangular box that he distressed and stained. We love the end result. The living room is small, cozy and perfect for snuggling up in front of the fire for a movie. I love all of the windows in this room. We had to get creative as far as clothing storage and furniture placement. We decided to place our king sized bed on the wall with the door that leads to the stone patio. We placed a curtain on the door window and permanently locked the door so that from the outside you don't see the back of our headboard. You see the same curtain fabric that the other windows are adorned with. We had to create a border for the tufted headboard to be mounted onto since there was an uneven surface from the door, door knob and window. The border was painted white and the headboard was mounted on top of it. The wallpaper was removed (once again by my amazing Mother). We chose a light gray paint for the bedroom that I painted one late night after a stressful Architecture Review Board meeting. We listened to old romantic music by Vaughn Monroe and Edith Piaf as we painted. At one point when I was rinsing out a paintbrush in the kitchen sink the power went out. It was pitch black. It terrified us. Thankfully it went back on shortly. It is especially strange because it hasn't gone out since. We found two wardrobes to add storage and chose ones with mirrored doors to reflect light and to make the room appear bigger. The king-sized bed is made up of three chest of drawers. This was also designed, built and painted by my father. The drawer handles were ordered from online. Finishing the wood floor in our master bedroom. Ohhhh... my bathroom, I mean... our bathroom! This is what dreams are made of for me. It didn't start that way though. The bathroom was the first room that my Dad and husband tore apart down to the wood. The floor had to be rebuilt to carry the weight of my dream: a claw-foot tub. The dry wall was completely ripped out after removing the fiber glass tub and shower. The room was extended to add more space. The dry wall in this room was the first my parents had ever re-done from scratch and they executed it flawlessly. Concrete board was applied over the wood on the floor to strengthen and secure the floor. My Mom and Husband subway tiled around the tub and shower area. Penny tile has been some thing on my wish list since visiting Paris the first time with my Mom my senior year of high school. I remember seeing it in the cafe bathrooms. It is so quintessentially French. I had to have it on the bathroom floor. Apparently, penny tile is not the easiest tile to lay. It was a frustrating process. The claw-foot tub has been a dream of mine since I was a little girl playing with my dollhouse. Colette's room is part of the original log cabin. The hardwood floors were kept original and were sanded and finished. The wallpaper was removed and we chose a pale pink paint color for the upper walls. The lower part of the bedroom is the hand honed wooden walls from the original cabin. We simply applied another coating of white paint. The ceiling light was changed to a chandelier. The sink was taken out of the bedroom, temporarily. We hope to add another small half bathroom to the upstairs closet. The built-ins were left in place and we plan to add white cabinet doors to the front for neat and tidy storage. The staircase to Colette's bedroom was the original staircase of the 1800s cabin. Although still sturdy the stairs themselves had a very narrow footing. My Dad carefully decided to build over the staircase with a wider step. It also kept the original stairs intact and protected. They stained the stairs and added non-slip that blended into wood. Handrails were added on both sides of the stairs. A wooden gate was built with love at the top of the stairs. After getting an estimate from a local fencing company that was more than what we wanted to spend we decided to research how to build a fence ourselves. We received the seal of approval from the Architectural Review Board and my husband borrowed a post digger. He used string and wooden stakes to mark with spray paint where each post would be dug into the ground. He painstakingly dug every post. Filled each hole with cement, centered and balanced each post. He did this well into the night. He then measured and cut each board, carefully with the help of my Mom lined up and nailed in each board. It truly was amazing! We had a date night and made the mailbox gate together. Let's just say when you think a project is going to be a quick one. It never is! But we did it together! The posts were each dug by hand with a post-digger and cemented in place by my superhero husband. Legends of a Civil War burial ground in our backyard was not enough motivation for my husband to leave the giant thorn pit well enough alone. He rented a "brush hog" to demolish this area. He spent an afternoon cutting, collecting and raking up the area. He then weeded and replanted grass seed. The results area amazing. It made our yard so much larger and allowed the perfect space for our garden boxes and shed. We've had people ask if they can use a metal detector in our yard to search for Civil War artifacts. I think I want to save that for a future Christmas present and project for my husband and daughter.